For many, the idea of joining a chorus can be quite a daunting one – a scary decision, and one they tend to put off for years. If you do make the decision to reach out and become a member of the LGMC, you won’t be disappointed. Just take a look at some of the comments below from our chorus members about their experience. The Chorus usually takes on members twice a year (in January and around August). While we want to give as many people as possible the opportunity to join the chorus, we also need to ensure it does not become too large or unmanageable. Membership is therefore reviewed at the end of each season to see if an intake is possible. The most important thing to note about the joining process is that you do not audition to become a member. You will be invited to a Voice Assessment Evening where your voice will be tested to decide which vocal part you would be most suited to, should places become available within that section of the Chorus. For more information about how the process of joining up works, please see ‘Frequently asked questions’ and details about the waiting list below. To sign up to the waiting list, send an email to intake@lgmc.org.uk. We’ll get in touch with you to confirm your details for the waiting list and then we’ll keep you updated on what’s happening, and let you know as soon as a Voice Assessment Evening is arranged. Not a problem! We welcome everyone, regardless of skill, because we’re a community chorus. Together, we learn and grow. It’s time to put down the shower head! Do you live for the music? Is it with you always? Share that passion with us, and grow with us in our Band of Brothers! You’ll be amazed how many new songs you learn. Being a member of the Chorus opens up opportunities to meet hundreds of new people. Our members have made friends and some have also met their life partners. Every week from 7pm to 10pm on Monday. We also have a monthly all-day weekend rehearsal. Towards a performance, members are also required to attend a dress rehearsal/band call(s), usually held during the week before the performance. The Monday rehearsals are usually held in Camden. Our full day monthly rehearsals are also usually based in North London. Occasionally it’s necessary to rehearse elsewhere, but the rehearsals are always in London. Due to the level of interest we get in becoming a member of the Chorus we need to operate a waiting list. For more information about how the waiting list works, please see below. We have 4 voice sections – Bass, Baritone, Second Tenor and First Tenor. Additionally, there is a small group called the LGMC Ensemble. This is a group of 16 members auditioned from within the current membership. For those who want extra involvement, you can also volunteer to get involved with one of our committees – Marketing, IT & Internet, Music, Production, Membership and others. Does it cost to join the Chorus? There is a monthly fee we ask our members to pay in order to cover the costs of running our organisation. The exact cost will be confirmed with you when you are confirmed as a member. You don’t need to be able to read music to join the chorus. You will notice on your Taster Evening that sheet-music is handed out. Don’t worry about it though, most of our new members can’t read music, but you’ll pick it up very quickly! How do I become a member of the Ensemble? The Ensemble is an auditioned group from within the existing membership. Positions come up every so often and when they are available, are usually auditioned very quickly to ensure we have sufficient vocal balance. Does the Chorus go on tours? Yes, both internationally and locally. For example, in 2016 we toured to Brighton, Leeds and Newcastle, and the year before we performed at Prague Pride. I can't sing, but I want to get involved. How can I? If you don’t want to sing with the Chorus, there are still opportunities to join as a ‘Semitone’ – a non-singing members who helps out in various ways, such as front-of-house at one of our shows, or on one of our committees (music, marketing, etc.). I joined the Chorus after losing my partner of 25 years. It really was a lifeline for me, and I can honestly say that I wouldn't have been able to cope without the strength of my new found Band of Brothers. I’d seen the chorus a few times, but it was after the 2013 Halloween Ball that I finally signed up. I have to admit to being nervous when the intake evening arrived, but everyone was really friendly and welcoming. It’s great to have met so many new people and made so many firm friends through the Chorus, not to mention the thrill of walking out on stage. It’s undoubtedly one of the best things I’ve done in my life, and my only regret was that I didn't do it earlier! I joined the chorus because I enjoy singing and enjoy being gay, and with LGMC you get to do both. Ten years on I still turn up because: the banter is good; it’s fun to perform to both old friends and the uninitiated; when rehearsing or performing I forget all about my day job, empty bank account and emptier bed; and I enjoy challenges such as hitting the high note in the Sondheim number, how to survive a 3 hour gig on a barge with no powder room, and how to weave a glove striptease into my “Santa Baby” routine. I’d never really had a strong group of gay friends. I love my straight friends to bits but there was always something missing and I was tired of convincing them to go to gay 'things'. I like to sing and I thought by joining the LGMC, I'd could make lots of gay friends and sing my heart out. I’ve had an amazing experience, travelling to Dublin and performing at amazing venues and inspirational events. Now I even live with two of them in a harmonious (well we try!) household. I love the guys and wouldn't change them for the world. For more than 15 years the chorus has enriched my life and opened up opportunities for singing, friendship and service I could never have imagined, even into Buckingham Palace! Sign up to our waiting list now! Due to the level of interest we get in becoming a member of the Chorus we operate a waiting list. The way the waiting list works is described below. Once we receive your email to intake@lgmc.org.uk, your name will be added to a master list of ‘delegates’ in the order in which their request to join was received. You will receive a confirmation that your email has been received. This is not an automated process so if you haven’t heard from us within a few weeks of registering your interest, please contact intake@lgmc.org.uk to confirm that your request was received. We’ll need to assess your vocal range in order to know which voice part you belong to, so initially you are on a waiting list for a voice assessment. 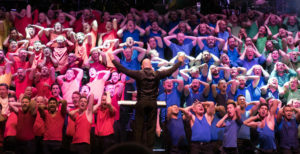 We conduct several Voice Assessment Evenings throughout the year at which time we invite a group of delegates to join us for an evening which will be conducted as a chorus rehearsal, and during which all the attendees will have the opportunity for their voice part to be assigned as well as to learn more about what it means to join the LGMC. Delegates will be invited to a voice assessment in wait-list order (i.e. the order in which they registered their interest to join the chorus). If you can’t make the date for which you have been invited, don’t worry, you’ll maintain your position on the list and you’ll be invited to a voice assessment at a later date. Once we know your voice part, your name will be added to a wait-list for the individual section to which you have been assigned. Once we have made a decision as to how many vacancies there are in your section for a new season, we’ll send invitations to join as a singing member. Again, delegates will be invited to join their section in date-order based on when they originally placed their name on the master wait-list (not in the order that they were assessed to the section). We have two concert seasons each year, one beginning in January, the other usually in September, so we will invite new singing members to join a maximum of twice a year, shortly before the start of a new concert season. If you are unable to join the chorus at the time that you are invited (for instance because you are unable to commit to the rehearsal schedule for that particular season), you will retain your position on the wait-list for your section. In the meantime we will do our best to keep you informed of how things are coming along, including advanced notice of voice assessment dates and the schedules for upcoming concert seasons. So, if you’re ready to sign up, just send an email to intake@lgmc.org.uk and we’ll be in touch soon.